The actress surprised media and fans as she turned up for the Padmavati 3D trailer launch this week. Deepika was seen dressed in an ethnic attire during the trailer launch and looked absolutely gorgeous. Post the trailer launch, when DP was interacting with the media, we got a hilarious picture of her. This expression of the actress makes us assume that she was asked a question and she looked at the reporter thinking if he was for real? The actress is often seen posing for goofy and quirky pictures. In fact during Diwali when Jacky was clicked at an awkward moment, she herself shared the image as she couldn’t get enough of it. We totally love Jacky’s cool attitude. So this time, as the paps were clicking her at the airport, she was seen making funny faces for the cameras and it’s something you cannot miss. 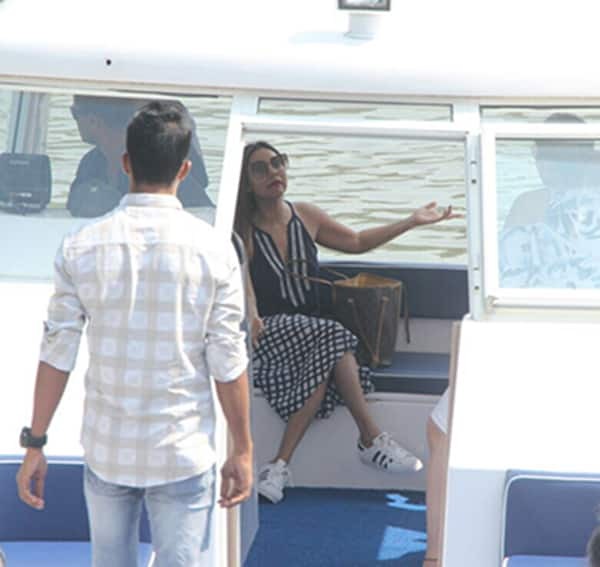 This week Shah Rukh celebrated his birthday at his bungalow in Alibaug and Gauri was snapped on a boat as she was heading there. This expression of Gauri clearly shows that she is upset over something? Don’t you agree? Just like Jacqueline, Sunny too shares a love for goofy pictures. If you go through her Instagram account you will come across many goofy pictures of her which are absolutely adorable. This time, too, during the rehearsal for a song, Sunny was seen making all the dancers pose along with her and posted the picture on Instagram.